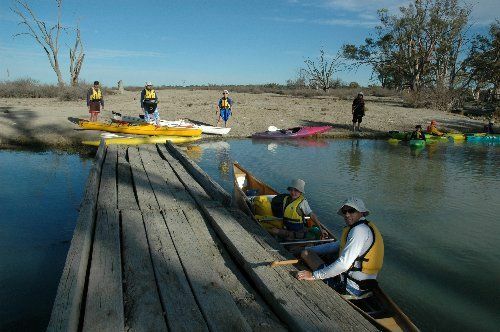 Chowilla is for paddlers with appropriate equipment and a basic skill level the Chowilla region is an interesting and safe area to explore. Never-the-less, in addition to the planning considerations outlined in the Canoe Guide, there are some other important issues to consider as the area is quite isolated. A detailed map and basic map reading skills are necessary when embarking on an extended trip into the area. It is also important to check the weather forecast before embarking on an extended trip. In the summer, day time temperatures can be over 40˚C and so adequate precautions need to be taken on those days, such as staying in the shade and minimising physical exertion during the heat of the day, drinking adequate quantities of water and wearing appropriate sun protection. The Chowilla Regional Reserve consists of 20,075 hectares of floodplain and wetland. The area displays great stands of the majestic River Red Gum, the hardy Black Box as well as Lignum and Coobah. The river and floodplains provide an ideal habitat for a large number of native flora and fauna. The Chowilla flood plain region is listed as a wetland of International Importance under the RAMSAR Convention. The area with its many creeks and waterways provides an abundance of canoeing and kayaking opportunities for people of any skill level. The Chowilla Regulator is situated approximately 1.3kms from the end of Chowilla Creek. Most of the time it is open and kayaks/canoes can paddle straight through it. During times of managed inundation a portage around the regulator will be necessary (approximately 150m). Operation of the Chowilla regulator is likely to start late in winter and finish 3 or 4 months later. Contact the DEW office in Berri for current information (08) 8580 1800. During winter, on cold, rainy days with the effects of wind chill, hypothermia is an issue. Appropriate waterproof and warm clothing, shelter, stoves, food and water are necessary equipment in case of an emergency. Nights can be below 0˚C during winter and so a good quality sleeping bag and a tent are essential for overnight expeditions. After heavy rain the clay soils of the Riverland Parks floodplain become very boggy and when necessary the Rangers close access roads to prevent damage to the environment. Even when the roads are open, vehicle users are strongly encouraged to avoid wet patches so as not to become bogged and damage the environment. During hot weather snakes may be encountered and paddlers need to be aware of where they walk and where they put their hands. A compression bandage and a knowledge of snake bite treatment is essential. During the warmer months mosquitos can be a problem. Mosquitos on occasions carry the diseases Ross River Fever and Murray Valley Encephalitis. To avoid being bitten by mosquitos (a particular problem on dusk), clothing which covers all exposed skin plus an insect repellent is recommended. The insect repellent is handy to repell flies which can be a problem at that time of the year during the day. A tent with a good quality inner which is insect proof is recommended. Watch out for In leaf litter, spiders, scorpions and other invertebrates are likely to be encountered which, with common sense, can generally be avoided. If someone in the group has an allergic reaction to invertebrate bites, there are creams available from pharmacies which reduce the pain, inflammation and itching from stings. This should be included in your first aid kit, and is generally all that is needed if you are unlucky enough to be bitten. When camping at Chowilla, as River Red Gums are prone to dropping limbs without warning, it is highly recommended that one avoids camping under them. The level of the water throughout the Chowilla system can vary. Thus one must be aware that banks may be slippery, submerged logs may not be apparent, and the depth of water may vary greatly. Due to factors such as fallen trees, very shallow water and reed growth, not all the creeks within the Chowilla area are easily navigable. The maze of creeks can also be very confusing for paddlers without good navigation skills (much of the Chowilla area has no mobile phone coverage). Other variables include higher than usual flow rates, inundations caused by use of the Chowilla Regulator and current weather conditions. It is highly recommended that paddlers get local and current information when planning a trip in the Chowilla area. It is highly recommended that at all times when paddling in the Chowilla region, protective footwear such as sneakers or wetsuit shoes are worn for protection from sharp sticks and stones, broken glass and bites. Sun glasses are recommended as protection from sunglare and head high vegetation. When planning a trip it is wise to apply for permits as early as possible, because on occasions, the parks are closed for feral animal control. In many of the creeks there is likely to be a significant current which means that paddlers need to be able to steer and control their boat confidently. This is particularly relevant when paddling with the current as it is quite easy to be pushed into bridges or fallen trees across the creek resulting in a capsize, and a struggle to get to safety. Throughout the Chowilla creek system there are numerous weirs which must be portaged around. At all times paddlers must stay well away from weirs as they pose a serious threat to safety. In the larger creeks such as Chowilla and the River Murray, one might encounter power boats and houseboats. In that case all craft must keep to the right of the water way to allow them to pass on your left. This is particularly important on blind corners as power boats might be approaching at high speed. It is important to note that when encountering speed boats on the river, their wake will make the water quite choppy and can be challenging for inexperienced paddlers. This is also an important consideration when paddling on open water when there is a strong wind. The fire danger season for all Riverland Parks begins on November 1st and ends on April 30th (this differs to the fire restriction dates set by the CFS). During this period only gas fires are allowed. There are no fires permitted on days of total fire ban. At other times campers are encouraged to practice minimum impact procedures by using a gas stove which is faster and cleaner for cooking. This will minimise the impact on the environment as trees and dead wood are homes for native animals. If using a camp fire, Keep it small and use a small amount of wood. Bring your own firewood. Use only dead fallen wood. Use existing fireplaces where provided otherwise, dig a shallow pit (30cm) for the fire, in a cleared area, 3 metres away from vegetation, trees and tree roots. Rainfall averages around 240 mm per year, but is very erratic, varying from 150 mm to 550 mm per year. Most years have below average rainfall, with a few years well above average. Winter air temperatures are reasonably mild during the day and cold at night (averaging 4.5˚C and 16˚C maximum). Summers are long and warm to hot. The daily minimum (averaged over the summer months) is 14˚C and the average maximum is 31˚C. Temperatures in excess of 40˚C are common. Where to go and What Will I See? Entering the Creek at marker 636. 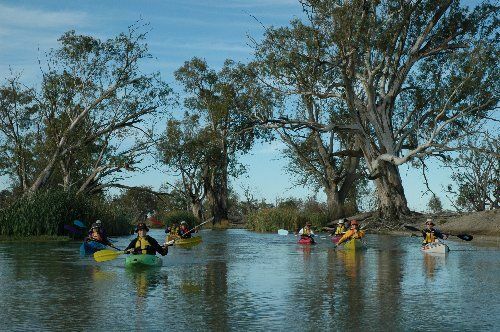 As mentioned in the Canoe Guide there are many possible trips in the Chowilla region depending on the time available, the conditions and the water levels. It is worth noting that the small creek at the 636 km mark (a few hundred metres north of Border Cliffs) can flow swiftly and has several large trees across it and should be avoided at all costs, unless one is highly experienced at paddling in moving water. At the 638 km mark a short portage is possible to gain quick access into the Chowilla floodplain from the river. Hypurna Creek adjacent to the 648 km mark is usually not navigable. The junction of Salt and Hypurna Creeks (grid reference 024358) is choked up with willows and may require portaging. The best route from Salt Creek is keeping close to the eastern bank. At the junction continuing down Hypurna is a challenging option. Hypurna is a narrow, scenic creek but it has several willows at the upstream end which need to be portaged around. Also the bridge which is amongst willows can be hazardous with the current behind, it is advisable to portage around it as well. This and many other bridges of this type are used by the grazier to walk the sheep on and off the islands. From then on it will be necessary to carry boats over or around numerous fallen logs before reaching open water. Continuing on down Salt Creek from the junction is a more straight forward option. There is a bridge at 956466 approx, which creates a downstream hazard and may need to be portaged. Slaney Creek is a good option to access or exit the system. The Isle of Man area is rather choked up with weeds. The Eastern side is the best route around the island (May 2005). This route is recommended as the portage around the weir on Pipeclay Creek is easier than portaging around the Slaney Creek weir. Bridge hazard on Punkah Creek. Boat Creek is a good alternative route although there may be some fallen logs to portage over. 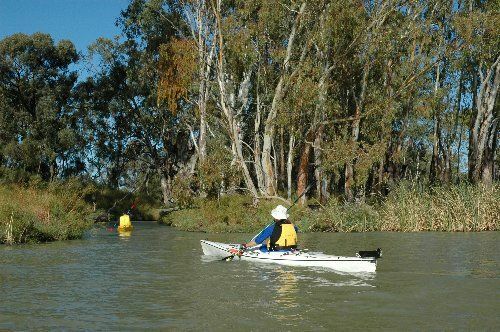 It is possible to paddle back to Renmark via either the Ral Ral Creek system or the River Murray (approximately 25kms). Bulyong near Renmark is a popular camping site. In the area near Tareena (018408) there is evidence of management to address the issues of salt in the creek system and maintain the high biodiversity values of the flood plain. The Chowilla Integrated Natural Resource Management Project aims to reverse the declining health of this fragile and unique landscape and reduce the impacts of the saline groundwater outflow to the River Murray. The Todd Obelisk, Old Scab Inspectors House and the Temporary Observatory on the Old Coach Road are worth a short walk. These trips provide opportunities to explore the area on foot as well as by kayak or canoe. 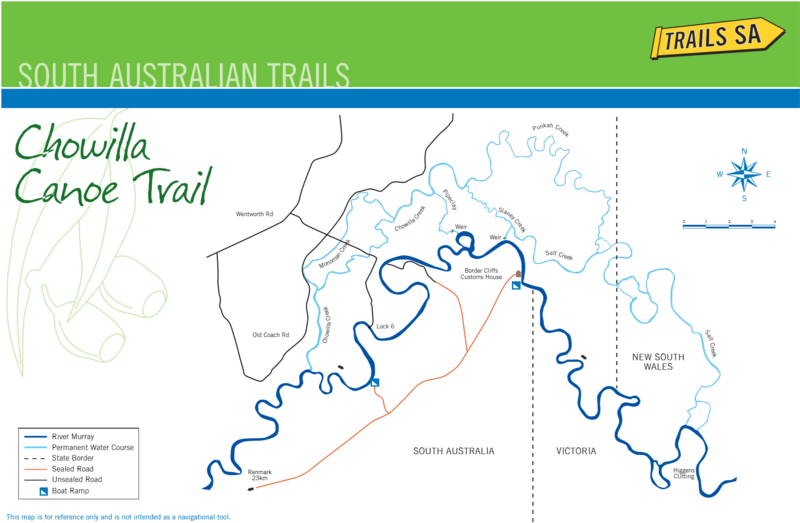 The suggested routes outlined below refer to the River Murray Canoe Guide – Chowilla. Please go to Canoe Guide Retailers for a listing of where these maps can be purchased. From Border Cliffs Customs House canoe launching area (961406) north of the boat ramp paddle upstream for approximately 1 km to the portage point at the 638km river marker. (972397) At this point you will need to carry your boats along the foot track to Hypurna creek (100m). After completing the portage, paddle upstream (departing to the right/south) in Hypurna Creek for about 1.5km, where you will find the creek becomes more difficult to paddle, due to reeds. Return to the portage point, carry back to the main river and paddle back to Border Cliffs. Hypurna Creek is an interesting and varied backwater on the floodplain, with abundant birdlife. As one paddles along the creek, fallen trees will be encountered in the water and will need to be negotiated. From the canoe launching point (as above) paddle downstream on the River Murray for 3.5 kms. Enter the lagoon surrounding the Isle of Man via a small opening in the reeds in the eastern branch (938416). Explore the backwater as far as the weir in Pipeclay Creek. There should be abundant birdlife in the lagoon. Return to the starting point at Border Cliffs via the same route. Allow at least 4 hrs depending on wind, as the open sections of the Murray can be choppy. This could be an overnight as there is a nice campsite at the weir. From Border Cliffs Customs House canoe launching area (961406) paddle upstream to the portage point at the 638km river marker. Carry over to Hypurna Creek and paddle downstream (to the north) on Hypurna Creek past the intersection of the Chute (not named) to the junction of Hypurna and Slaney Creeks (1.3Km). Be cautious as there is often significant flow coming out of the Chute. This flow continues to the junction of Slaney and Chowilla Creeks. At the junction turn left (west). Follow Slaney Creek northwest for 6km to the junction of Chowilla Creek (C). Turn left and follow Chowilla Creek 3.3km to the west to the junction of Pipeclay Creek (D). Turn left onto Pipeclay Creek. You will now be paddling against the flow, which can be significant. Paddle upstream for 3 km to the weir. A line of buoys marks the danger area below the weir. You must now carry (portage) past the weir using the steep track on the eastern side of Pipeclay Creek. As there is abundant birdlife in the lagoon, allow some time to explore in this area. To enter the Murray you must use the eastern branch (938416) of the Isle of Man lagoon. Turn left at the Murray and paddle upstream for 3.5km to Border Cliffs. Although this is can be completed in a day by experienced paddlers, or it is a nice overnight for those who like to have a look around. As it is nearly 20km, it is wise to plan for an overnight and carry the necessary provisions. Possible campsite numbers are 22-25. A recommended full day trip would be the 15.3 km circuit around Monoman Island incorporating Chowilla and Monoman Creeks for those with an appropriate level of fitness. Starting from any of the Monoman Creek campsites (8-17 which are accessible from the Old Coach Road), paddle downstream in Monoman Creek to the southern junction of Monoman and Chowilla Creeks (this distance will vary depending on the starting point). Turn north at the junction, paddling 6.5km to point E, the junction of Boat Creek and Chowilla Creek, then a further 1.8km along Chowilla Creek to the northern Monoman Creek. Turn left and continue along Monoman Creek to the starting point. Allow a full day for this trip depending on your speed. Be aware that you will be paddling against the current for some of the time. In general, touring speeds are around 4-5km/hr and can vary significantly with the current. Variations of this loop can be made, for example, overnight stops at any of the marked campsites or the trip can be shortened. The other rivers which are designated permanent watercourses on the Chowilla Canoe Guide are generally navigable. In some cases they may be shallow, subject to fast currents or require lifting the canoes over snags. Particular care should be taken in the vicinity of weirs and footbridges. Canoeists must get out of their canoes well before these hazards and determine the best way to carry their craft around them. It is worth obtaining the Old Coach Road Historical Trail brochure from the Renmark Visitor Information Centre and visiting the various sites while paddling in this area. In 1864 Richard Holland obtained the Bookmark Station Lease for his stepsons John, William and Robert Robertson to graze sheep and cattle. Bookmark extended from near Berri to the NSW border. This was before any white settlement in the area. It was from the Bookmark lease that the government granted the Chaffey brothers the first irrigation colony in Australia at Renmark in 1887. In 1896 Bookmark was divided into Chowilla and Calperum stations with Robert taking Chowilla and John taking Calperum. Chowilla is still owned by Robertson-Chowilla Pty Ltd and operated by Jock and Lis Robertson as the major shareholders. The current lease is a regional reserve Crown Lease administered by the Department of Environment and Heritage (DEH) under the National Parks and Wildlife Act. This allows for multiple use of the area. The historic shearing shed and quarters constructed in the 1870’s are used to this day. The area is alive with history and one story of interest is the legendry “Possum” the hermit who roamed the area for 54 years and who is immortalised in a monument at Wentworth. A Biography of Possum is available from the Renmark Tourist Office. The Old Coach Road was used as the main mail route between Blanchetown and Wentworth during the late 1860’s to the early 1900’s. A pamphlet outlining this driving heritage trail with historical markers is available from the Renmark Tourist Office and DEH in Berri. Most of the sites of historical interest are accessible by road or a short walk from the Chowilla, Monaman and Punkah Creeks on the Canoe Guide. This area has numerous designated campsites with good vehicle access and is a suitable area to begin a variety of short or extended trips.